The planning for this residential estate required the assimilation of a very complex program into a diverse and ecologically sensitive landscape. The 30-acre site comprised several once-distinct properties that had been aggregated over time. 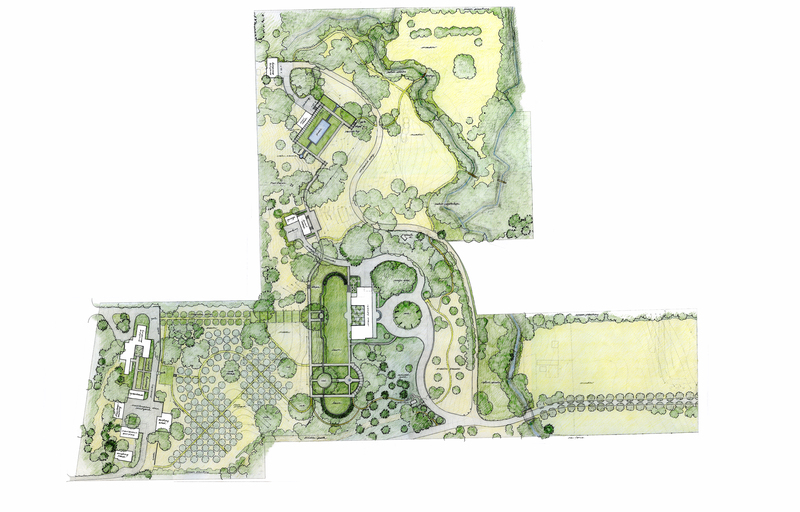 The master plan design sought to unify the entire property and to enhance the connections to the landscape through gardens and other features in sympathy with both the architecture and the natural environment. Historical research provided the basis for several elements of the proposed design, including the gardens close to the main house and the restoration of the topography that had been altered by poor development over the last century. New elements included a guest house, swimming pool, and an olive orchard. A public-access bridle path crossed the heart of the property, and raised issues of privacy and community. Several existing and under-used buildings were incorporated into a much-needed maintenance area, concealed behind a long garden wall. This maintenance area, a significant project in itself, included offices, a greenhouse, gardens, work areas, material storage, and parking for employees and visitors. The layout of over 130 Arbequina olive tees follows the bowl-shaped topography.